Francesca Pola is the curator of the exhibitions in the pluri-annual project Contemporary Art at Villa Pisani (Arte Contemporanea a Villa Pisani), begun in 2007, which commissions contemporary artists to carry out works conceived specifically for Villa Pisani in Bagnolo di Lonigo, a juvenile architectural masterpiece by Andrea Palladio. The project is coordinated by Luca Massimo Barbero and organized by Associazione Culturale Villa Pisani Contemporary Art in collaboration with A arte Invernizzi, Milano. 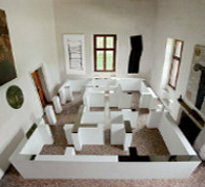 The exhibitions are designed to welcome the visitor as a guest into a private home, in which the works become fully part of the Villa, and this form of interaction with the spaces is seen in the works of fourteen international artists: Nelio Sonego and Michel Verjux (2007), Igino Legnaghi and François Morellet (2008), Alan Charlton and Riccardo De Marchi (2009), David Tremlett and Bruno Querci (2010), Niele Toroni and Arthur Duff (2012), Nicola Carrino and Arcangelo Sassolino (2014), Pino Pinelli and Mauro Staccioli (2016). Some of their works are still part of the Villa and park, for which they were conceived, forming a harmonious part of the entire complex. 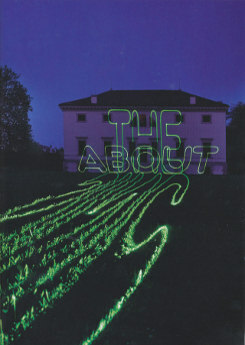 All exhibitions are accompanied by monographic catalogues (bilingual, Italian and English) including an introduction by Manuela Bedeschi and Carlo Bonetti, critical essays by Luca Massimo Barbero and by Francesca Pola, bio-bibliographical appendix of the artists and the images of their works realized for Villa Pisani. 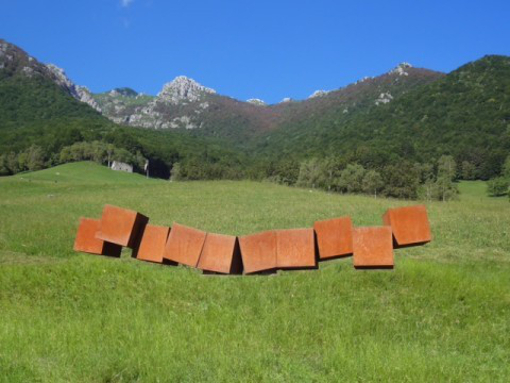 For an artist like Nicola Carrino, who since the 1960s has chosen to carry out a sculpture that is a dialogue of places rather than being a self-referentiality of objects, the relation with architecture understood in its broad sense of constructed and habitable anthropic intervention has always been the indispensable element. Not only primarily as a formal reference of inspiration and proportion (in the creative relationship with preexisting historical sites as also in his collaborations with today’s architects), but in what we can define as the archetypal identity of architecture: that is, in its being both rational and expressive hypothesis aimed at the creation of a free space of human relation. Carrino’s sculpture can in fact be defined as a sort of extended town planning of plastic thought: it constantly presents itself as the possible project of a positive habitation possibility of man’s space founded upon the relations between individuals and what they build, translated into a transformational adhering to the given situations. It is precisely this concrete and humanistically relational constructive tension that has always constituted the primary and authentic foundation of Carrino’s creative process and is once again to be found declared in new directions in Villa Pisani in the meeting with the Renaissance building by Andrea Palladio. From the very beginning of his creative career, what lies at the heart of Arcangelo Sassolino’s work is the idea of rendering tangible the physical and concrete energy that binds human beings and the experience of what surrounds them in its maximum possible emotive charge. By way of unexpected processes of relation Sassolino activates both persons and forms of behaviour with regard to places, objects and events, working on a radical and unusual dimension that we could define as fundamental alterity. The artist proceeds to the continuous recreation of equilibriums and relations in an alien recording of spaces, images and objects. Constantly permeated by a tension that is intentionally taken to the extreme degree of intensity, his works are true devices in image with which he recreates our experiences by means of a dynamic based upon attention: organisms of artifice which activate our cognitive acquisitions in reasonings that don’t behave as the result of logical and sequential deduction but thanks to physiological and instantaneous apprehension. 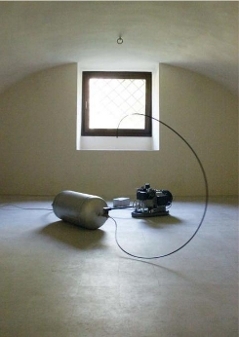 We find this concrete gnoseological foundation of Sassolino’s work, based on the emersion of the latent energies of matter as the possibility of eliciting thought, in his new series of interventions exhibited in Villa Pisani. If this building combines its ‘refulgent’ monumentality with a welcoming dimension of domestic openness and practicability, then the works with which Sassolino has intended to mark our experience of this place are characterised by an analogous expressive diversification. 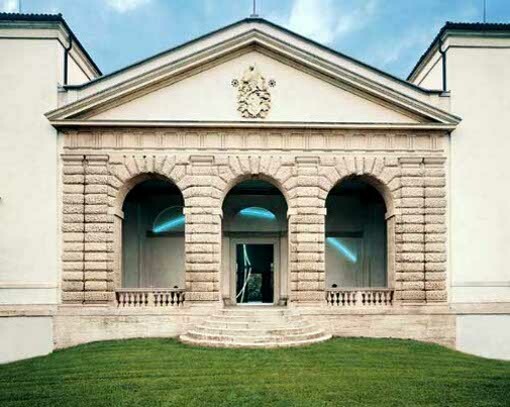 The works created by Niele Toroni in the Villa Pisani are emblematic of a key aspect of his art, which here finds its quintessential expression in the way it measures up to the historic and spatial parameters of this extraordinary Palladian building. What we see is the anti-rhetorical, anti-monumental approach of his work, which tends not to appear as an assertive, overbearing centrality of an ‘other’ image, autonomous and independent, but rather as an interacting presence that works on the distinctions, limits and margins that separate and unite painting and space, and on their reciprocal positioning. Toroni has chosen the large central hall as the hub around which his project revolves, choosing to intervene on the counter façade of the loggia, towards the river and, in particular, on the large blind Diocletian window on the upper part, and on the two small doors below. The artists concentrates on these spaces, which are at once real closed thresholds and potential light openings, once again adopting the operative characteristics that have been part of his visual language since the 1960s: strokes of a no. 50 brush at regular intervals, 30 cm apart. 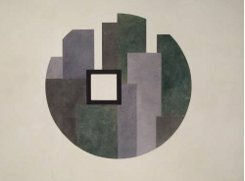 He thus introduces an element of visual progression into the monumentality and formal assertiveness of the Palladian architecture, creating a regular, modulating movement (the brushstroke at set intervals) which, in its multiplications, brings into question and complicates the structural balance of the Renaissance building in a place of transit. When discussing his creative work, Arthur Duff tends not to talk about ‘works’ but rather about a single, constant ‘experiment’. Similarly, when referring to verbal or luminous elements – which are some of its main components – instead of using expressions like ‘word’ or ‘light’, he prefers terms such as ‘information’ and ‘voyage’. Starting out from these considerations about the fluid, anti-intellectualistic identity of his poetic vision, we can attempt an interpretation of the exhibition he has devised for Villa Pisani. Not so much in the superficial terms of a sequence of apparently highly technology, spectacular works as in those of a complex, strictly contemporary, volatile rendering of the structural and architectural identity of the place. This creates a dialogue with the spatial coordinates of a present that consists almost entirely of experiences of digital and virtual reality. In the works that Duff has created for Villa Pisani, we can see the hypothesis of a spatial translation of light as a connective element. This light is thought of not as an external, atmospheric dimension but rather as a complex noetic space of a constant, ever-changing flow of information. 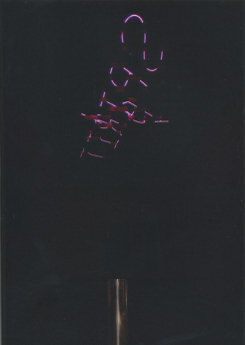 In the laser projections, which are based around a combination of luminous artificiality and spatialised language, and in complex stratifications of alluded stellar fragments, Duff sees light as a metamorphic possibility prior to a transition (a voyage, as we have seen) into a universe of information, as a potentially infinite physical and dynamic material. An eternal, ubiquitous relationship with architecture has always been an element that not only characterises but also, and more in particular, defines David Tremlett’s work. For decades the artist has been creating wall drawings on site, with characteristic features and methods that are entirely his own, and this process is brought about by a genetic relationship with the structures he works on. This is why the fact that he has been invited to create a work for Villa Pisani has a very special, twofold significance. Firstly, the idea that Tremlett would “inhabit” these premises with new signs and colours, though without betraying them, and that he would continue along the lines of a European tradition of measure and equilibrium, confers a new identity upon these Palladian premises. Secondly, his interaction with such a particular and distinguished architectural context constitutes a possible moment of change and uniqueness in his own creative development. […] The artist’s decision leads to a decisive encounter with Palladio’s architecture, and this somehow comes naturally to him, as we can see in his sense of volume and proportion, and the power of his alternation of straight and curved lines. There is no departure from measure, but rather an internal vitality - a “Palladian counterpoint” - that penetrates into the very structure of the building, like a skin that takes on colour and ignites, caressed by the artist, whose hands run over a wall and clothe it in new and coherent spaces. He adopts a relationship of scale that is humanistic at every turn, from its poised harmony within the structure and also in the way it is calibrated between the architecture and those who “inhabit” it (whether the proprietor or the visitor), through to its harmonious balance between artifice and landscape, and in its definition of proportions and colours. 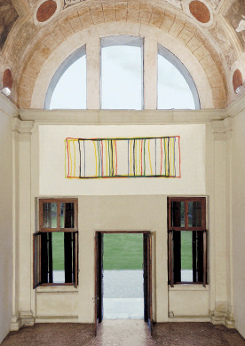 The idea of Palladio’s construction, which is defined by its alternation of curved and linear volumes, and its arches and walls, can be found again in the chromatic forms that Tremlett uses in his work: facing each other in a carefully calibrated variation that tends to duplicate the presence of colour by modifying its form, and vice versa, from one side of the wall to the other. This is a visual and ideal construction that, in its solidity and cohesion, intentionally takes up the physical overlapping and intertwining of the real construction of the building: a “collage”, as the artist himself has referred to it, in which nothing is left to chance but what is of interest is the very specific nature of a particular choice and formal relationship. In relating to the Palladian architecture of Villa Pisani, Bruno Querci has chosen to put the emphasis on a formal and ideal relationship that for decades has been an essential part of his work: this is an orthogonal interweaving of formal axes that are horizontal and vertical. 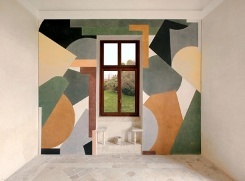 By emphasising and, in a sense, measuring them within the structure of the villa, the artist has created a series of focal points in the building. These visual spaces bring out the primary dimensions it is based on. By doing so, Querci has created a series of large-format works which follow a precise alternation in order to bring about various possible relationships - physical, structural, visual, and ideal - between image and architecture, with light as the unifying element. Riccardo De Marchi’s work involves a fundamental dialectic between volume and surface that is expressed in the perforated traces with which the artist creates an image reflecting his cognitive requirements. The density of the hole and the mirror, forming clear loci of repeated and controlled signs, determines this active negative of space, which is, however, always characterized by the effectiveness and the concrete presence of his gnosiological obsession with occupation and understanding. 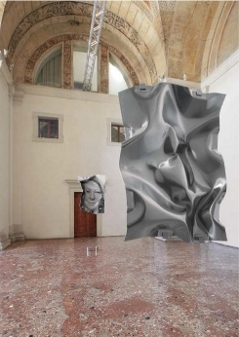 In De Marchi’s works, the hole and the mirror - independent and complementary, and dialoguing and assimilating multipliers of volumes through the surfaces – reveal the solid locus of matter coming into being: physical and immanent, they show us the reciprocally and simultaneously negative and positive double of an existential measurement of the spatiality, which, without attempting to allude to a metaphysical beyond, investigates its own tangible unfolding as an image. The work is the epiphanic terrain of this physiological memory existing before writing, which sensitizes and measures the space of existence; it determines it and restores it to us in its significant contingency. As he himself likes to repeat, De Marchi makes holes in order to “understand something”: he acquires in empathy and reproduces in entropy; in his work, he recreates, without subjection, the dynamics of existence that establishes itself in its always potential totality, acquiring spaces and dotting them with their densities. 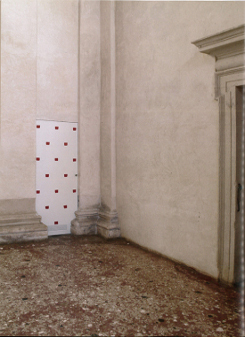 In the Villa Pisani, Palladio’s architecture is reinterpreted by De Marchi as volume and surface in a number of series of traces reproducing its rational and relational artificiality - in other words, the constructive dimension of an artistic language that, in the occupation of the space, articulates its “Alfabeto possible” (Possible Alphabet, which is the title of one of his recent works). The basic theme characterizing these new works is the investigation of this house: its construction, its habitability and its spaces that live thanks to those who cross them. The crossing, the fundamental dimension of De Marchi’s work already at an operational level (piercing the volume and the surface), allows it to reproduce Palladio’s structure, translating it into his own recording of multiplying and expansive figures that form an appropriative relationship. Alan Charlton’s artistic language has always been characterized by an oxymoronic progressive cyclicity: his obsessive return every day to painting the same grey picture, which, however, always turns out to be different from the previous one. As he stated in 1969: "I am an artist who makes a grey painting”. The use of the indeterminate article twice allows us to understand his total identification with his artistic practice. Charlton’s painting asserts its radical alterity and concreteness against every remnant of illusoriness of the painting’s surface: there is, therefore, a continuous and controlled metamorphosis of a single absolute work. This is the centre of what, for the artist, is his practice, every day and without substantial changes: thus his painting is the investigation and acquisition of an increasingly extensive space for knowledge of and relationship with reality. 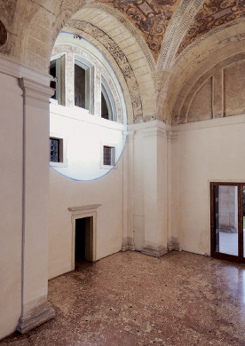 On this occasion, Charlton’s intervention at the Villa Pisani is entirely conceived as having a direct relationship with the doors of the villa’s central hall, which he has measured, reconsidered and reinstated through the works placed above each of them. The existing thresholds have been duplicated, multiplied and complicated by new thresholds shown in the paintings, focusing on the idea of space and tactile experience of the volumes it is possible to pass through, and the extended and ascensional paths of Palladio’s architecture. 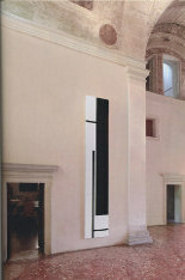 […] In this case, the variations of the different greys characterizing the artist’s works have a specific significance linked to the dialogue with the different areas that the works occupy, in a variation that responds to the spatial and light stimuli resulting from the articulation of this building. Thus, it is possible to observe, in the relationship between the interior and exterior stressed by the large windows to be found in the Villa Pisani, Charlton’s usual attention to the correspondence between his work - and the grey and its application - with the passing of time. This induces him, for example, to note, for each painting, the weather conditions at the time of its execution. The story of the relationship of François Morellet’s work with architecture is a long and complex one and attests to his continuous but fundamental interest in the transformations in which his artistic language is involved: in the Villa Pisani, the French artist has written an important new chapter in this story, revealing to visitors an imaginary journey that, with his light signs, opens up new perspectives for reinterpreting and concretely going over the historical and present identity of Palladio’s building. The relationship between art and architecture has always been regarded by Morellet as an encounter - or rather confrontation - between mutually independent modes of expression: it is an opportunity for finding new spatial configurations, to complicate and articulate a discourse consisting of primary communicative elements, which find new solutions in their mutual contact. This is an expressive code of reduction and contradiction that have made him one of the leading figures of the art of the second half of the twentieth century. Because of this strong sense of the generative independence of an artistic language that tends to give concrete form to the image of a possible relationship that has not been created in a constructive manner, but rather has been poetically modulated, Morellet generally refers to his interventions with regard to architecture in terms of "disintegration". This is in marked contrast to - or an alternative to - the "integration" characterizing a whole cycle of works in the 1950s: "What interests me now is architectural “disintegration”. For instance, I find an alternative rhythm to that of the architecture and play with the interferences between these two rhythms. My rhythm - that is, a regularly repeated space - can be represented by a painted line, a rod, a simple volume and so on. I want these interventions to take place after the building itself has been constructed: in other words, in no way must they be integrated with it. They may be more or less discreet, depending on the place. Generally speaking, architects don’t like them - I’ve had first-hand experience of this - because they seem to disregard their aesthetics or the structures of their buildings. Thus, it’s quite normal that the work itself should consist of the struggle between the two structures: theirs and mine." With regard to this continuous reconsideration of a new and creatively (in)determinate “rhythm” - which intentionally interferes with the situation as it was constructed previously by proposing an alternative “aesthetic” or a new mode of physical relationship with the space - it must be stressed that one of the most important elements of Morellet’s work has always been his capacity to reconsider itself in relation to the periods and contexts that his creativity has had the chance to encounter and interpret, while maintaining an underlying coherence according to which his expressive code aims at the greatest possible communicative intensity, as a result of a formal reduction that finds in the sign - whether this be graphic, sculptural or light - the primary tool of his artistic language. 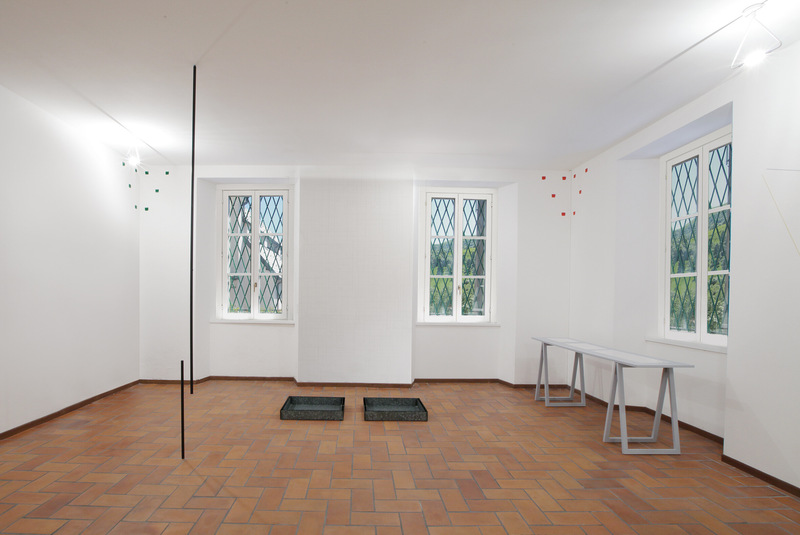 Morellet’s project for the Villa Pisani involves a series of interventions, which, through the use of neon and in the relationship with the existing architectural elements, construct a path that allows visitors to become aware of the building’s formal and spatial significance. The “rhythm” of this revelation is provided by the presence of the light sign, which takes different forms according to its location in relation to the architecture. Sculpture as a desire for contact, for a relationship with the basis of what surrounds us and speaks unceasingly of its remaining beyond time and beyond the physical limits of history; sculpture as an eternal moment and a concrete possibility of an encounter, a network and node of active relations, and a concentrate of human energy: this is the vision that Igino Legnaghi offers us in this exhibition intended to create a dialogue with the spaces of the Villa Pisani at Bagnolo di Lonigo. It is an invitation to start listening, to allow ourselves to be imbued with all the active tensions of the civilization that are present here and continue to speak to us in the marvelous distillation of lines and volumes of the building designed by Andrea Palladio. This presence of dialoguing alterity, with its desire to become the centre of the link and equilibrium between the existent and the possible, is the generating nucleus of the sculptures Legnaghi has created for the Villa Pisani. […] Closely related to the building’s specific architectural features, mathematical structures and proportions comprise the basis for the sculptures designed by Legnaghi to be scattered in the park surrounding the Villa Pisani, establishing a "path of reflection" on its spaces and a harmonious relationship between form and life, and artistic creation and the natural dimension. 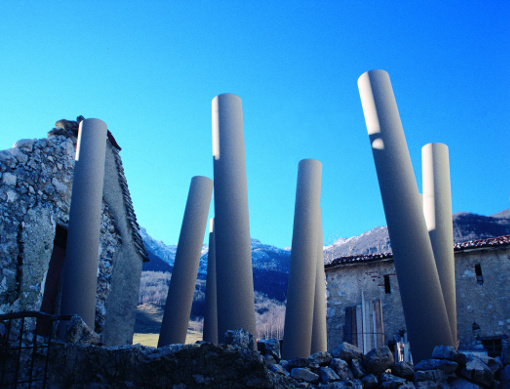 In accordance with a logic of elementariness and communicative efficacy based on the geometric form and technological materials, Legnaghi’s sculptures draw on this relationship with the natural environment, which is the constituent element not only of the fascination but also of the very concept of Palladio’s building. The large openings of the Villa’s windows appear to invite those inside to enjoy an extensive view of the surrounding park in a relationship that Palladio himself intended to be significant because, for him, the natural setting was the necessary counterpoint to the formal identity of his buildings. It is this "organic" concept of the form, intended to be "definite" and open rather than "definitive" and closed, that may be regarded as one of the bases of the dialogue established on this occasion between Legnaghi and Palladio: this is an approach to design that cannot be expressed by a purely abstract form, but projects itself into reality, becoming a possibility of existence, the elementariness of which is not merely synonymous with stylistic simplification or neutrality of intent, but with clarity that seeks to relate practice to existence. 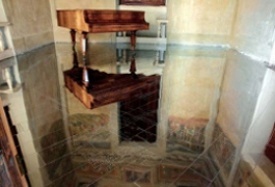 So it is that the path marked out by Legnaghi’s sculpture may be seen as an attempt to recompose these macro-forms that communicate in a human manner and are disposed around the Villa along various directrices of meaning, all of which lead back to their generative relationship with nature and the building, according to the dynamics of internal and external proportion that allow them to become the locus of active experience. 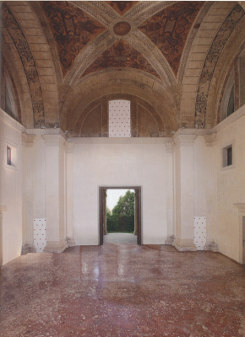 These works by Nelio Sonego and Michel Verjux have been created specifically for Villa Pisani in Bagnolo di Lonigo; they have been devised to have a direct and active relationship with both the architectural spaces and the historical memory of this Palladian building, as well as being closely involved in a reciprocal dialogue. So they set out to represent a point, in a particular place and at a particular time (that of the show), where it is possible to gather together and meet, to be inspired and follow various itineraries. All this refers not only to the variety of stimuli originating from the context of the historical villa, but also to its possibilities for up-to-date experiences of two different contemporary perspectives for both viewing and interpreting. This complex and multi-layered temporal dimension (which, not by chance, is a particular and indispensable characteristic both of the Palladian edifice and of the poetics of the two artists) represents the main way in which Sonego and Verjux have worked both inside and outside the building’s spaces, consequently creating an exhibition that permits a new experience of the relationship between the villa and the visitor: the creation of a living journey through the past, present and future times of seeing, viewing being considered as the physical and mental place for the totalizing confluence of various creative manifestations. This confluence of implications, which we can discern in the complexity and interference of various temporal states and flows, is not translated by Sonego and Verjux simply by moulding the works to fit in with the pre-existing spaces as well as with their own reciprocal characteristics and personal creativity but, instead, by decisively affirming a manner of intervention that is a genuine, concrete animation of the spaces of the villa; this they do by enriching itineraries and points of interest with new routes that cross and penetrate the existing ones without, however, annulling them or taking their place. In this way Villa Pisani increases its own identity as a historical and artistic monument of exceptional value by a positive and prepositional relationship with present creativity, all within a perspective that is neither rhetorically commemorative nor coldly allusive, but retraced and renewed through images that give a new sense, character, and meaning to the location. […] The relationship between inside and out, continually underlined by the works by Sonego and Verjux, is a key for understanding just how one of the most significant roots of the show lies precisely in this invitation to perambulate and investigate in continuation - through the various materialisations of the temporal places stratified within the context of the villa - with the aim of discovering their future possibilities. 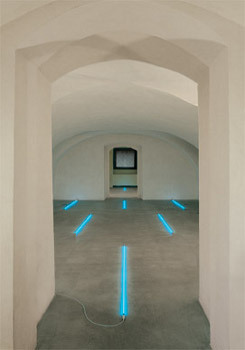 This aspect is further underlined by the very creative manner of Sonego and Verjux: the former employs acid and electric-coloured paint while the latter uses luminous projections; in both cases they are explicitly contemporary and in obvious contrast with the “warm” context of materials and hues of the villa. Francesca Pola is curator of the open-air Contemporary Art Museum of Morterone, which exhibits large scale works by numerous international artists that are specifically created in order to “maintain a dialogue” with the surrounding natural context. The project is promoted by Epicarmo and Sostene Invernizzi and developed by the Associazione Culturale Amici di Morterone in order to make Morterone - a tiny commune at the foot of the Resegone - become an open-air museum. 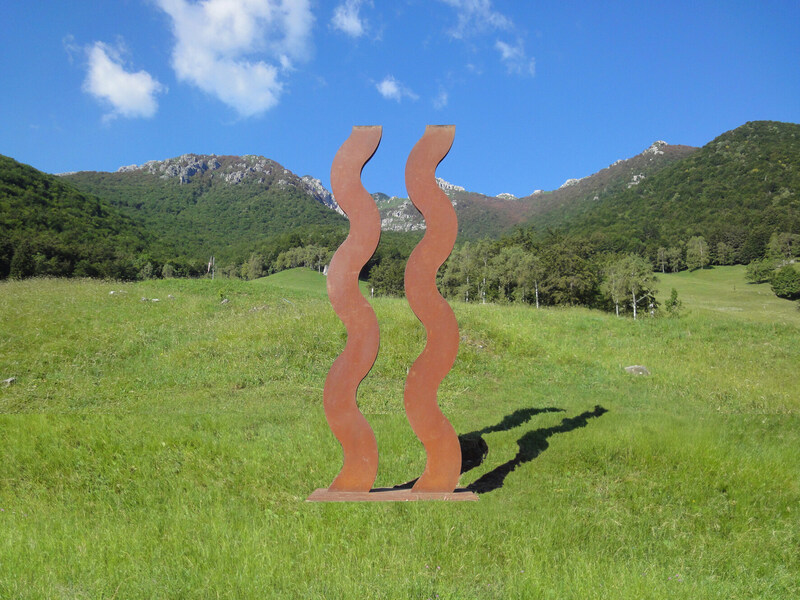 It began at the half of the 1980s and has allowed the installation of works of art that hold a dialogue with the surrounding territory in which they are immersed, in this way creating a permanent collection of more than 30 works by both Italian and international artists. 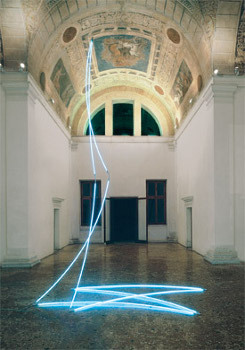 Works installed in the open air are by Gianni Asdrubali, Francesco Candeloro, Nicola Carrino, Lucilla Catania, Carlo Ciussi, Gianni Colombo, Igino Legnaghi, François Morellet, Pino Pinelli, Bruno Querci, Ulrich Rückriem, Nelio Sonego, Mauro Staccioli, Niele Toroni, David Tremlett, Grazia Varisco, Michel Verjux, Rudi Wach. During the years, in the exhibition room of the Palazzo Municipale, were held exhibitions with works by Italian and foreign artists who have always frequented and loved the land and community of Morterone. These include Rodolfo Aricò, Alan Charlton, Dadamaino, Riccardo De Marchi, Lesley Foxcroft, Mario Nigro, Günter Umberg and Elisabeth Vary. The initiative has emerged from a conception of the artistic process as an act of knowledge, and not as a prevaricating form of operative alterity. From this point of view it is closely tied to the world of “Natura Naturans”, a poetic-philosophical conception that originally arose right here in Morterone - an uncontaminated hollow at the foot of the Resegone, on the side opposite Lecco - and for many years now at the centre of Carlo Invernizzi’s musings. 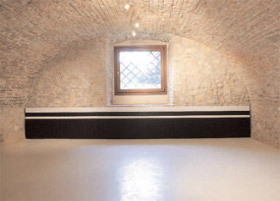 During the Summer 2013, in the exhibition room of Palazzo Municipale, was held the exhibition “Marines – Morterone: même combat”, with a selection of works from the Billarant Collection with works by Carl Andre, Robert Barry, Stanley Brouwn, Peter Downsbrough, Sol LeWitt, Lawrence Weiner, Donald Judd, Claude Rutault and Fred Sandback. 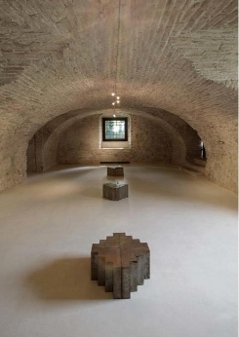 These works by important exponents of American and European Minimal and Conceptual art, in an ideal dialogue with Le Silo private museum at Marines near Paris, have underlined Morterone’s specificity as laboratory for Contemporary Art. 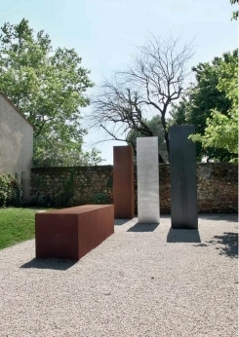 Françoise and Jean Philippe Billarant chose Morterone, another special “place of the spirit”, to present an important selection of their collection in a sort of ideal link between these two atypical places of artistic though. A concentration of works was chosen with care and also with love in order to have a dialogue with the experience of Morterone, which hosts numerous other artists found in their collection. In short, “même combat” (same battle), the title chosen for the exhibition, inspired by a work entitled Morterone – Paris: même combat, by one of the artists who is certainly closest to the collectors, Niele Toroni, exhibited last year in Morterone and is still being exhibited. This is exactly how the ideal affinity between the two places is demonstrated: a happy “struggle” for knowledge, for the active support of creativity that goes beyond the vacuity of the effect, of or sensationalism as an end in its own right. A support that can instead remain as a heritage of absolute though, translated into the humanity of the artistic work. A particular union made up not only of image, but also, and to a greater degree, of feelings, thoughts, visions, curiosity, relations, friendships, dialogues, sharing and of many other immaterial values which substantiate it with a special human “magic”. 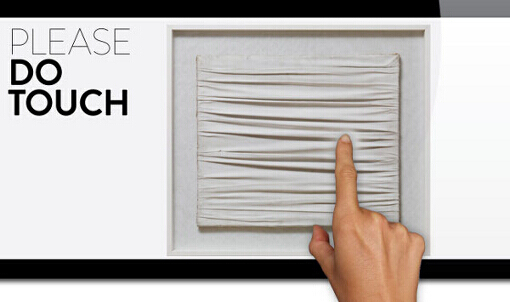 A tool offered to visitors to deepen and enrich their experience of the exhibition, conceived in close and direct relation with its contents, providing in-depth information and background, in line with the “worksite” approach on which the presentation of the Intesa Sanpaolo twentieth century art collection is based. It includes audio-visual contributions created for the occasion, video footage of the artists included in the exhibition, plus thousands more images which can be viewed on interactive touch screens.